This capability involves testing water-splitting semiconductors and semiconductor-based devices using simulated and actual solar (on-sun) illumination to validate solar-to-hydrogen (STH) conversion efficiency. The first step is to take incident photon-to-current efficiency (IPCE) measurements to get the wavelength dependent conversion efficiency for each subcell absorber junction. This is necessary to calculate a spectral correction factor to adjust measured photocurrent densities to a reference spectrum for objective comparison of performance to other devices. 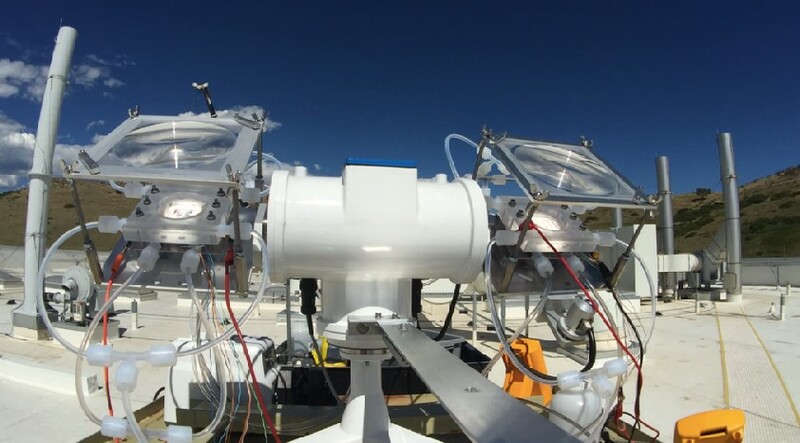 Outdoor measurements are taken using collimating tubes to isolate the direct component of the solar spectrum to minimize errors due to coupling of the diffuse component of solar radiation to the semiconductor by the photoreactor cell. 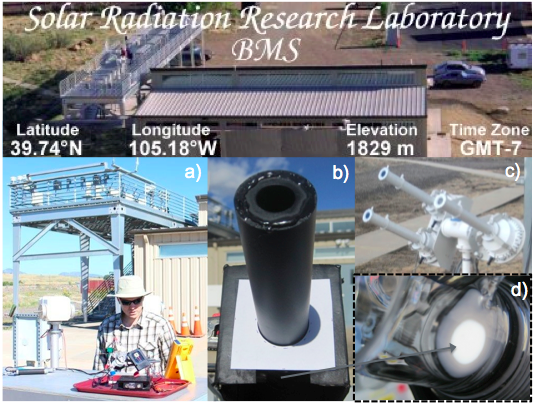 Continuous research-quality measurements of the characteristics of local solar irradiance are recorded at the Solar Radiation Research Laboratory (SRRL) at NREL every minute from over 80 instruments including pyranometers, pyroheliometers, pyrgeometers, anemometers and other meterological sensors. Details on the measurements and data sets can be found on the SRRL Baseline Measurement System website. This data is used to calculate real-time STH efficiencies from short-circuit current density measurements of the device. 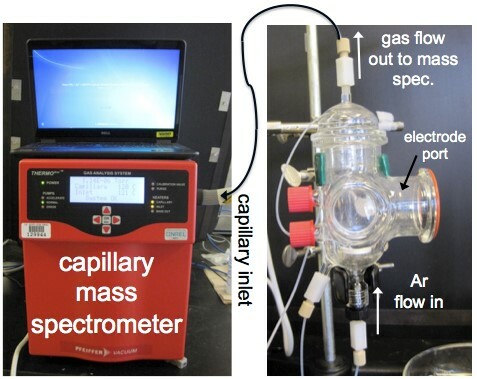 These broadband STH efficiency measurements are corroborated by integrating the IPCE over the reference spectrum and making Faradaic efficiency measurements with a capillary mass spectrometer. For measurements of STH efficiency over time, we have an EKO STR-22G Sun Tracker that has a 20 kg payload capacity and a pointing accuracy better than 0.01°. Inline capillary mass spectrometry (ThermoStar GSD320, Pfeiffer Vacuum, 1-300 amu) is also available through this capability node for the purpose of sampling gas streams near atmospheric pressure continuously (up to one data point per second) and in real-time. Analog mass/charge scans can be performed to identify unknown species by their mass/charge ratio, or the response of a known species can be monitored continuously over time and quantified when suitable calibration standards are used. For hydrogen and oxygen yield measurements, a NIST-traceable primary calibration gas standard and calibrated mass flow controllers are available. Other relevant calibration gas standards may be obtained as needed. As examples, hydrogen/oxygen cross-over could be quantified under various operating conditions or degradation reactions that produce vapor-phase species could be detected and monitored. Custom cells may be required to accommodate various electrode geometries. Existing cells can accommodate sample diameters of about 5–25 mm. What sets this capability apart from other benchmarking facilities is the co-location of STH testing with the collection of solar radiation data at SRRL, the home of the world's largest collection of radiometers in continuous operation dating back to 1981. Another unique characteristic of this capability is its extraordinary availability due to the excellent solar access intrinsic to Colorado. Long-term STH efficiency testing is limited by availability of the tracker that can vary based on demand. Dozens of short-term STH efficiency measurements can be performed daily but are weather dependent. Additional rooftop space at the ESIF is designated for on-sun STH benchmarking and long-term testing. This capability can verify/certify STH efficiencies under true solar conditions that are difficult to accurately measure using simulated laboratory conditions, especially for multijunction systems. Figure 1. On-sun benchmarking: a) 80+ instruments logging real time data; b) collimating tubes; c) pyroheliometers and a spectroradiometer provide d) precisely defined illumination of a PEC cell. Figure 2. The ThermoStar GSD320 (Pfieffer Vacuum) capillary mass spectrometer (left) is shown with laptop running the QUADERA control and analysis software. An example application (right) is the PEC cell designed for performing Faradaic efficiency measurements. Figure 3. Solar tracker and dual mounted photoreactors (mounts available for up to four photoreactors) as located on the roof of the Energy Systems Integration facility, which houses NREL’s PEC capabilities. Figure 4. Photoreactor design drawings. Photoreactor chassis assembly shown on left and the removable, customizable sample mounting “chuck” shown on the right. J.L. Young, M.A. Steiner, H. Döscher, R.M. France, J.A. Turner, and T.G. Deutsch, "Direct solar-to-hydrogen conversion via inverted metamorphic multi-junction semiconductor architectures," Nature Energy 2, 17028 (2017). D. Kang, J.L. Young, H. Lim, W.E. Klein, H. Chen, Y. Xi, B. Gai, T.G. 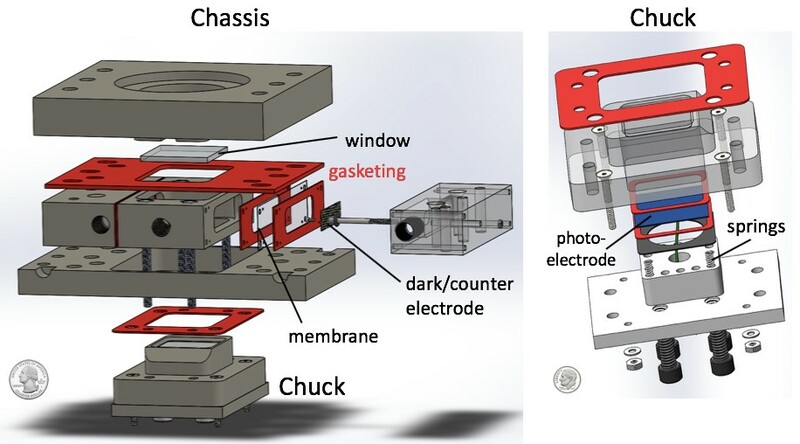 Deutsch, and J. Yoon, "Printed assemblies of GaAs photoelectrodes with decoupled optical and reactive interfaces for unassisted solar water splitting," Nature Energy 2, 17043 (2017). H. Döscher, J.L. Young, J.F. Geisz, J.A. Turner, and T.G. Deutsch, "Solar to hydrogen efficiency: Shining light on photoelectrochemical device performance," Energy Environ. Sci. 9, 74–80 (2016). C.R. Osterwald, "Translation of device performance measurements to reference conditions," Solar Cells 18, 269–279 (1986).